We are pleased to honor Dr. Suvro Sett, Chief of Pediatric and Congenital Cardiac Surgery at Westchester Medical Center, for his dedication, skill and caring in saving the lives of Gift of Life children at Maria Fareri Children’s Hospital through cardiac surgery. Dr. Sett received his M.D. degree in 1983 from the University of Saskatchewan in Saskatoon, S.A. in 1983. He immediately became a Clinical Assistant Professor in 1983, and rose to Clinical Associate Professor in 1996 at the University of British Columbia, where he taught until 2004. During this same period he also held various internships and residencies, and from 1991 to 1993 he was a Duncan L. Gordon Fellow in Pediatric Cardiac Surgery & Cardiovascular Research at the Hospital for Sick Children in Toronto, Ontario. 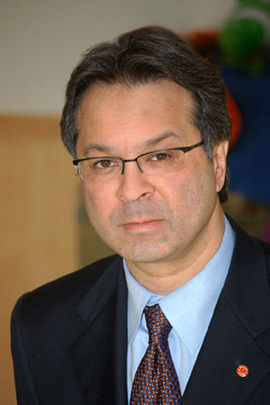 He was a pediatric cardiovascular and thoracic surgeon at British Columbia Children’s Hospital in Vancouver, British Columbia, from 1993 to 2004, and adult congenital cardiac surgeon at both St. Paul’s Hospital and Vancouver General Hospital in Vancouver from 1997 to 2004. In 2004 Dr Sett came to Westchester Medical Center in Valhalla, New York, where he became Chief, Pediatric and Congenital Cardiac Surgery at the Medical Center and Associate Professor of Surgery at New York Medical College. He was named Professor of Clinical Surgery in 2006. He teaches 3rd and 4th year Medical Student Lectures on Congenital Cardiac Surgery. He has also taught a number of Cardio Vascular (CV) Surgery Residents and has supervised other graduate students, medical students and allied health students as well over the course of his career. Dr. Sett’s area of special interest is neonatal myocardial protection. He has received a number of research or equivalent grants, has been invited to make many presentations at various hospitals and has a published a long list of articles in journals. Dr. Sett is married to Merrilee Jean (nee Gardiner) and they have a 14 year old son, Stephen. We are very grateful that this talented and skilled surgeon has volunteered his time on several occasions to perform lifesaving surgery for children to give them a new lease on life. He truly exemplifies “Service Above Self”. Starting in 1920, our first doctors began providing care simply because the people of our area needed it. Today, driven by that same dedication, we’ve created a center of medical excellence for the entire Hudson Valley region — revered for its advanced care, highly specialized treatment, and biomedical research. As the leader in pediatric care and an advocate for children’s health, Maria Fareri Children’s Hospital at Westchester Medical Center is the only all-specialty children’s hospital in the Hudson Valley region and Fairfield County Connecticut. Today, Westchester is home to one of the most unique and advanced children’s hospitals in the world. With hundreds of clinical and surgical specialists in almost every medical field, the entire hospital is dedicated to the health and well-being of children—treating more than 20,000 patients each year. From pediatric trauma, intensive care, cancer and heart disease--this clinical expertise is provided under the spired roof of a state-of-the-art building that was designed from the point of view of children and their families, not just from the perspective of doctors and nurses. This concept is the cornerstone of a new approach in providing healthcare for children called “family-centered care”—involving parents, siblings and family members in a child’s treatment, every step of the way. This specially created environment enables medical specialists to provide the most advanced care to patients.